Caerleon RFC Petanque is a competitive but friendly club: old and new players are very welcome to come along for a game. 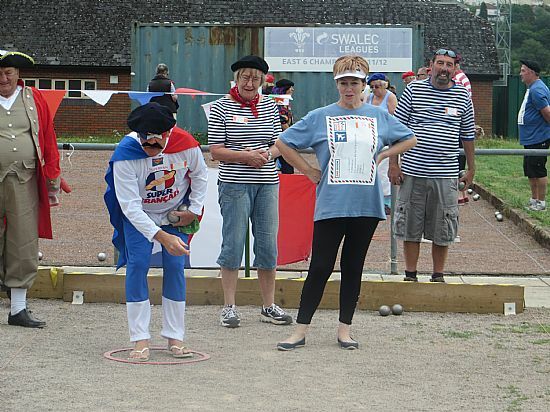 Petanque is a game that can be played by men and women, older people and children on an equal footing - so come to one of our melees (a sociable, 'joiner' game) and give it a try - they run every Thursday through spring and summer. For further information - see melee page. About the club: Caerleon RFC Petanque Club was established in 2005, and is affiliated to the Welsh Petanque Association. We have teams playing in both the WPA Welsh League and the local Boules in Gwent (BiG) League - and Club players have represented Wales and Great Britain in major competitions in the UK and abroad.